The proposed asteroid-smashing AIDA mission will send one small probe crashing into the smaller asteroid at about 14,000 mph (22,530 kph) while another spacecraft records the dramatic encounter. Meanwhile, Earth-based instruments will record so-called "ground-truthing" observations. The goal is to learn more about how humanity could ward off a potentially dangerous space rock. The necessity of developing a viable deflection strategy was underlined in many people's minds by the events of last Friday (Feb. 15), when the 130-foot (40 m) asteroid 2012 DA14 gave Earth a historically close shave just hours after a 55-foot (17 m) object exploded above the Russian city of Chelyabinsk, injuring 1,200 people and damaging thousands of buildings. "The project has value in many areas, from applied science and exploration to asteroid resource utilization," Andy Cheng, AIDA lead at Johns Hopkins University's Applied Physics Laboratory, said in a statement. Johns Hopkins’ Applied Physics Laboratory is providing AIDA's impactor, which is called DART (short for Double Asteroid Redirection Test). 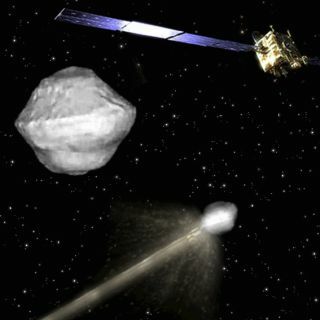 The observing spacecraft is known as AIM (Asteroid Impact Monitor) and will come from ESA.